The Fort Morgan area has become a vacation spot. Its beaches sit overlooking the Gulf of Mexico and tourists come from all over to watch the Dolphins and dip their toes in the sand. The sands of Fort Morgan carry an older, forgotten history, however. Most tourists will never know that the sands they play in were once soaked in blood. Fort Morgan began construction in 1812 and was finished in 1834 and was widely regarded as the "finest example f military architecture in the New World." The fort was constructed in a unique star shape that made it easier to defend. Fort Morgan and Fort Gaines sat on opposing sides of Mobile Bay and acted together to close the Bay off and defend the waters. Fort Morgan saw heavy fire during the Civil War. I was used defensively by the Confederates and was also a starting point for blockade running ships. The Union took the Fort during the Battle of Mobile Bay. 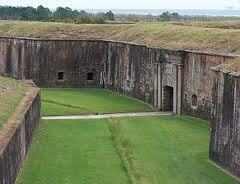 After Fort Gaines fell, Union soldiers laid siege to the fort an set the wooden parts of the fort on fire. Many men died in this battle and the Confederate soldiers did not meet happy ends. It is not surprising that this old Fort has more than its fair share of ghosts. It has a long history filled with war and fire. The old barracks are said to be one of he most haunted portions of the fort.. In 1916 or 1917 a prisoner hung himself in the barracks. According to local lore, you can still hear the hanging man cry late at night. He is not alone in his sorrow. During the Civil War, a bomb went off in the fort and several men met a horrible fiery death. The bomb went off in a room with a big fireplace and they say you can still hear the men screaming at night. The final ghost comes from an unconfirmed story of woe and sorrow. They say that some time in 19th a young woman was drug into the fort by unknown men. The woman was beaten, raped and murdered. According to legend, she still wanders the Fort looking for justice. Oddly, I've been to the beaches at Fort Morgan on many occasions, but never visited the old Fort. I hope to fix that mistake this summer on my visit. The very shape of the old fort seems to lend itself to ghosts stories and call to spirits to stay and linger. I can't believe I missed this little gem. I will be looking forward to hearing about your trip there and seeing the pictures. I wonder if the star shape is keeping the ghosties in? Another place for me to visit. Looks like a cool place. Looking forward to you sharing your pictures. Thanks for doing that...you are too kind. amazing how often we overlook the obvious! Fort Morgan isn't near as nice as Fort Gaines. At Fort Gaines they allow you to visit almost every part of the fort. Not so at Fort Morgan. The USS Tecumseh was also sank about fifty yards off the point from Fort Morgan. There is a buoy marking the spot there. Also, the 80's horror film "The Supernaturals" is based on events that happened in Mobile Bay at the end of the Civil War. I've lived on Fort Morgan RD. for 9 and a half years now and I go to the Fort with my friends at night all the time. I personally haven't experienced anything but my friend Jackson said the he saw a man in a confederate uniform leaning against on of the walls of the Fort. But Jackson had also mentioned that the mans head and chest had been blown off. I only wish to see that. @ Tim Kent-One of our team members has seen that exact soldier .We are Gulf Paranormal Society of Folely Alabama.See us on face book.We have video of our adventures of the fort. It was 1977, I was horrified as a child with my brother and 5 friends on a daycare summer field trip to fort Morgan. While roaming through the fort with a tour guide we came to an area with a barricade pationing off a back room in wick I walked around and entered a black musty cold room. 5 boys followed and with all of us peering into the darkness careful to stay in the light. All at once a luminescent form started walking towards us while in full full view we all screamed in unison and ran out terrified. Upon my exit I ran to the tour guide and asked if there was a projector in the room in the back. He smerked at me and said no silly shaking his head. Non of the adults believed us. I have never forgotten this experience. It was as real as any memory I process.